Vintage Art & Wine hosts a Birthday Paint Party at the Cheesemonger's Wife in Jacksonville, Oregon. Our Cherry Blossom Branches Were a Huge Hit. 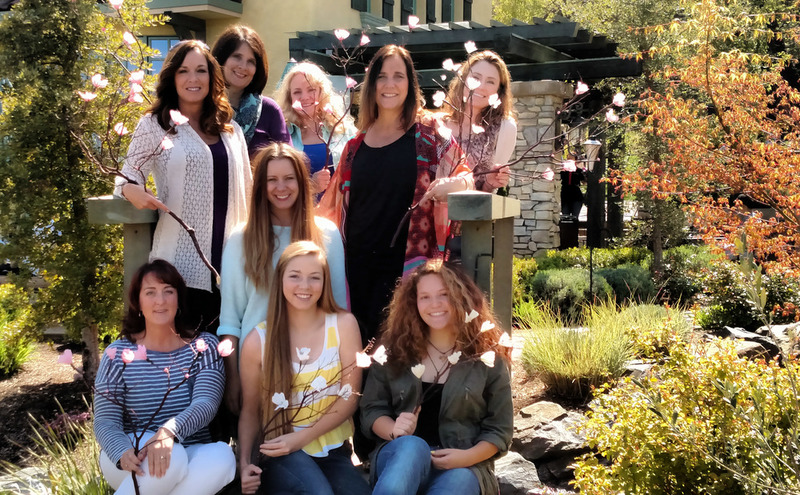 Recently, at Vintage Art & Wine, we hosted our first "Cherry Blossom Branch" class on April 12, 2015 at Dancin Vineyards in Southern Oregon. It was a huge hit and we hope to repeat the class again soon—but maybe not until spring 2016. Here are some photos from the recent class. Local Madrone tree branches, collected from the bountiful nature of Southern Oregon, are the base for this timeless project. Smooth deep red-brown bark makes these branches a beautiful backdrop for the Cherry Blossom Branch project. Can you believe this beautiful cherry blossom bloom—crafted from Italian Crepe Paper—so light, airy and real—yet this paper crafted bloom can last a lifetime when created with Vintage Art & Wine. Assembling the blooms wto the branch using green and brown floral tape. Attaching white blossoms to her Cherry Blossom Branch at Dancin Vineyards. Here is an 24 inch Cherry Blossom Branch displayed in an 20 inch antique vase. A happy Cherry Blossom Branch class after a Sunday afternoon party at Dancin Vineyards in Medford, Oregon. This quick video has many great tips on composition. Although this video refers to photography these simple rules apply to painting. Watch and get inspired—hopefully, it will help bring out our inner creative side. Watch this video for some great tips on composition. Our favorite place to teach classes has even more outdoor covered space for all weather. Pink perfection inspired by Sasha. Silver, white and iridescent glow. A small forest of trees…What color do you what? Comment below. Vintage art & Wine breaks DOWN the process into simple steps you will enjoy. We offer many colors to choose from—both bright and muted colors. Adding structure to the the abstract painting with masking tape—later we will remove the tape to reveal negative space. Removing tape to reveal negative space. Layering paint and adding spattering— another simple technique we will teach you. Adding texture by scraping away paint. A whole class full of wonderfully individual abstract watercolor paintings. Whether you prefer simple style, complex design, wild and colorful or subtle and muted, we will help you step by step to create your very own unique piece of art to save for yourself or give as a gift. Join us soon for a relaxed class at a winery near you! Vintage art & Wine offers many classes across the valley. Read more about other classes Here. At Vintage Art and Wine, we are all about creating memories. Recently, we hosted an intimate Mother/Daughter class. What a delight it was to sit and spend time with these two lovely ladies as the daughter prepares to go off to college and the mother prepares her heart to let her go. A child leaving the nest is something that needs to be cherished and celebrated. Taking time to enjoy each other's company while creating a flower together is a great way to create a memory that will last a lifetime. Happy mother and daughter in front of the pond at Dancin Vineyards. Our First Class: Paper Crafted Hibiscus at DANCIN Vineyards, Jacksonville, Oregon. Our first Vintage Art & Wine class at Dancin Vineyards was a a complete success. Our first class EVER, hosted by Dancin Vineyards in Jacksonville, Oregon was a complete success. We had so much fun creating our Vintage Hibiscus Flowers. An intimate group gathered under the large oak tree at Dancin Vineyards to create paper crafted flowers. Life-long friendships were renewed and new friendships were sparked. Here are a few photos from our first class. Happy Hibiscus Crafters at Dancin Vineyards, Jacksonville Oregon. She matches her flower—lovely dress, lovely flower. Petals and Stamen: This took about a half hour to create. Dancin Vineyards: Our host for our first class. Thank you DANCIN. Can you imagine a better place to share memories and create paper crafted flowers together? Dancin Vineyards, Jacksonville, Oregon, under the oak tree. So beautiful a bride would love to carry them. This is so much fun, and so simple anyone can make one. The result is a flower that can last a lifetime. People tell me all the time they are not creative or say "I'm not good at that". Vintage Art & Wine is here to show you how to awaken your creative side. 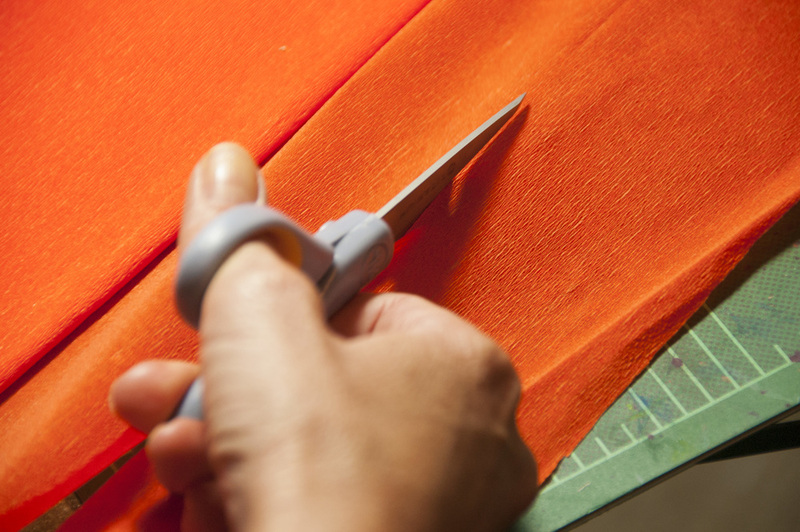 We offer pre-cut kits & step by step guidance—surprise yourself with what you can create. Make a flower as a gift, or for yourself—all while making memories with friends as you create in a beautiful vineyard setting. Now why would you pass that opportunity up? Sign up here. We are having so much fun planning our new business. Tara and I have been working hard to launch Vintage Art & Wine. Connecting with local vineyards and planning our lessons has been challenging, but exciting at the same time. Here are a few photos from the process of creating our first lesson. Join us for a class at a local vineyard in the beautiful Rogue Valley of Southern Oregon. We focus on vintage arts and crafts and painting with a modern twist. Come discover your creative side with Vintage Art & Wine.